Arlington, Va. – April 4, 2018 – PBS Distribution announced today that it is releasing “POV: BILL NYE: SCIENCE GUY” on Blu-ray, DVD and Digital HD. Bill Nye is on a mission to stop the spread of anti-scientific thought and action. Once the host of a popular kids’ show and now the CEO of the Planetary Society, he’s leading a mission to launch LightSail, a satellite propelled by sunlight, while in turn fulfilling the legacy of his late professor and Planetary Society co-founder Carl Sagan. With intimate and exclusive access, as well as plenty of wonder and whimsy, the film is a behind-the-scenes portrait of the “Science Guy,” who continues to inspire millennials to participate in STEM (science, technology, engineering and mathematics). In addition to Nye, the film features Neil deGrasse Tyson, Ann Druyan and many other notable voices in the field. 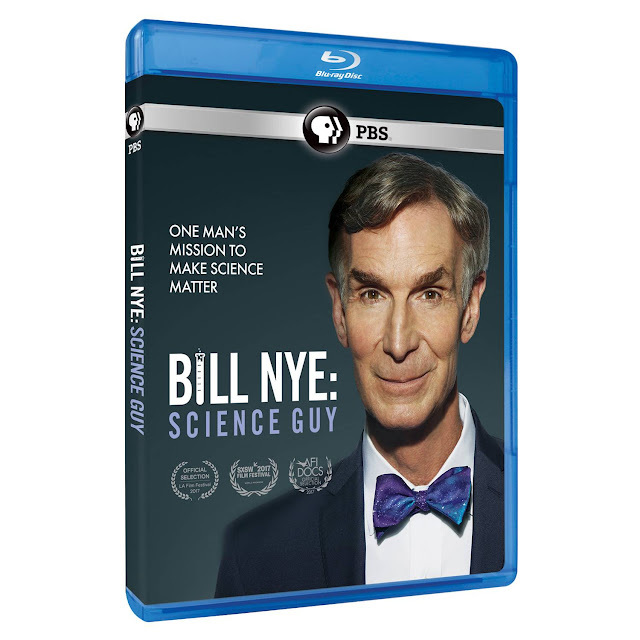 “POV: BILL NYE: SCIENCE GUY,” will be available on DVD and Blu-ray April 24, 2018. The run time of the program is approximately 90 minutes. The DVD SRP is $24.99 and the Blu-ray SRP is $29.99. The program will also be available for digital download. In addition to taking off his signature “Science Guy” lab coat, Nye has started taking on those who deny the importance of science, from prominent creationist Ken Ham to climate change skeptic, meteorologist and occasional Fox News commentator Joe Bastardi. Nye goes head-to-head to advocate for the scientific community and its invaluable findings. Accordingly, in his role as CEO of the Planetary Society, Nye and his team are working toward the first-ever successful launch and flight of a solar sailing satellite propelled by sunlight in space. “When I was in class 40 years ago, Carl Sagan talked about a solar sail mission, but it never happened. So, this is realizing a 40-year-old dream of building a spacecraft that could fly in space propelled just by light. So, Professor Sagan, this one’s for you,” Nye says as the satellite is being tested for the first time. Nye’s mission is driven in part by anxiety about what future generations may face. Sitting on climate change denier Joe Bastardi’s porch, Nye implores, “What if you’re wrong? What about Garrett?” Garrett is Bastardi’s college-age son, who is following in his father’s footsteps by studying meteorology and also shares his father’s skepticism about climate change. Nonetheless, Nye is not without his own critics. Even some in the scientific community feel there have been times when Nye’s mission has taken a back seat to his ego. Some say that by agreeing to a televised debate with Ham about our evolutionary origins, Nye gave Ham undeserved media attention. “Nye’s mistake was giving credibility to Ken Ham by giving him a public platform. Everything I’ve seen about Nye is that he really misses being the Science Guy because he was much beloved and very popular. It’s hard to give up celebrity,” says evolutionary biologist Jerry Coyne. The program also illuminates Nye’s private life. He remains close to his two siblings, who are struggling with a hereditary neurological disorder that Nye doesn’t have. Numerous friends, both from his childhood and from his Science Guy days, speak to his quirks and ambitions. Nye even opens up about his romantic life. Ultimately, the Science Guy and Nye are indistinguishable from each other. “Bill has always wanted to be famous,” one of his longtime friends says. Expertly chronicling the TV character and the very real human subject behind him, “BILL NYE: SCIENCE GUY” presents an absorbing, charming portrait of a man and his not-so-modest mission to educate and change the world. Major funding for POV is provided by PBS, The John D. and Catherine T. MacArthur Foundation, the John S. and James L. Knight Foundation, Corporation for Public Broadcasting and National Endowment for the Arts. Additional funding comes from Nancy Blachman and David desJardins, Bertha Foundation, Wyncote Foundation, The Fledgling Fund, Marguerite Casey Foundation, Ettinger Foundation, New York State Council on the Arts, Ann Tenenbaum and Thomas H. Lee, and public television viewers. POV is presented by a consortium of public television stations, including KQED San Francisco, WGBH Boston and THIRTEEN in association with WNET.ORG. POV films have won 36 Emmy® Awards, 19 George Foster Peabody Awards, 12 Alfred I. duPont-Columbia University Awards, three Academy Awards®, the first-ever George Polk Documentary Film Award and the Prix Italia. The POV series has been honored with a Special News & Documentary Emmy Award for Excellence in Television Documentary Filmmaking, three IDA Awards for Best Curated Series and the National Association of Latino Independent Producers Award for Corporate Commitment to Diversity. Learn more at www.pbs.org/pov/. American Documentary, Inc. (AmDoc) is a multimedia company dedicated to creating, identifying and presenting contemporary stories that express opinions and perspectives rarely featured in mainstream media outlets. AmDoc is a catalyst for public culture, developing collaborative strategic engagement activities around socially relevant content on television, online and in community settings. These activities are designed to trigger action, from dialogue and feedback to educational opportunities and community participation.